Theme: TBA at start of jam! 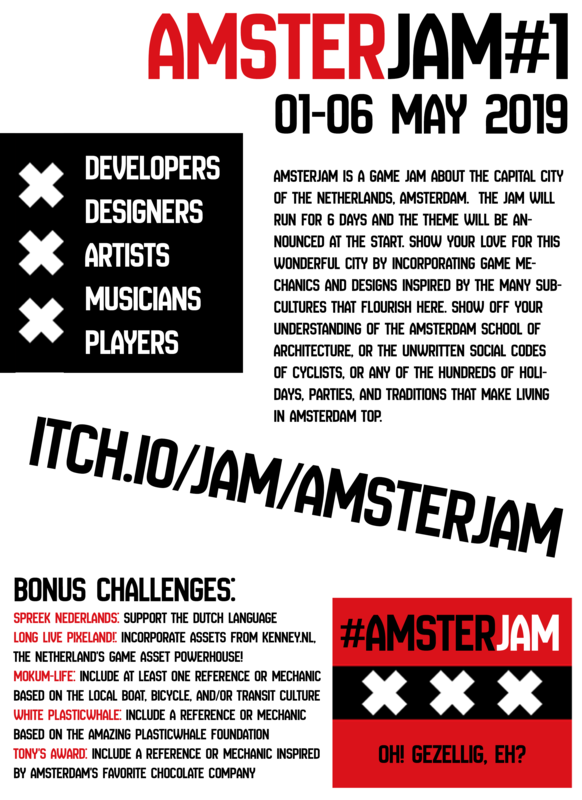 AmsterJam is a game jam about the capital city of the Netherlands, Amsterdam. The jam will run for 6 days and the theme will be announced at the start. Show your love for this city by incorporating game mechanics and designs inspired by the many subcultures that flourish here. Show off your understanding of the Amsterdam School of architecture, or the unwritten social codes of cyclists, or any of the hundreds of holidays, parties, and traditions that make living in Amsterdam top. New submissions only, projects must be created during the jam. You can use anything that is (a) it's creative commons/public-domain licensed, (b) you obtained permission in writing from the copyright owner beforehand, or (c) you obtained the assets legally through traditional means, such as downloading something from a reputable asset store. Judging period will be one week and open to the public. Unconventional media formats (e.g. pen-and-paper games) are also acceptable. Long Live Pixeland! : Incorporate assets from Kenney.nl, the Netherland's game asset powerhouse!